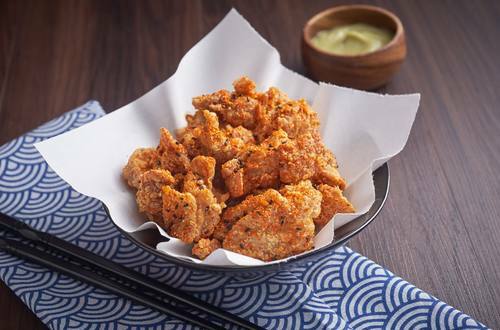 1 Karaage: Combine ginger, garlic, Knorr SavorRich Chicken Liquid Seasoning, Kikkoman and sake. Marinate chicken for at least 30 minutes. 2 Dust chicken with cornstarch and fry in hot oil. Drain oil and toss with Togerashi. Serve immediately with Matcha Mayo on the side. 3 Matcha Mayo: Mix ingredients. Serve on the side.